Photos - Observations - And don't miss the video at the end! 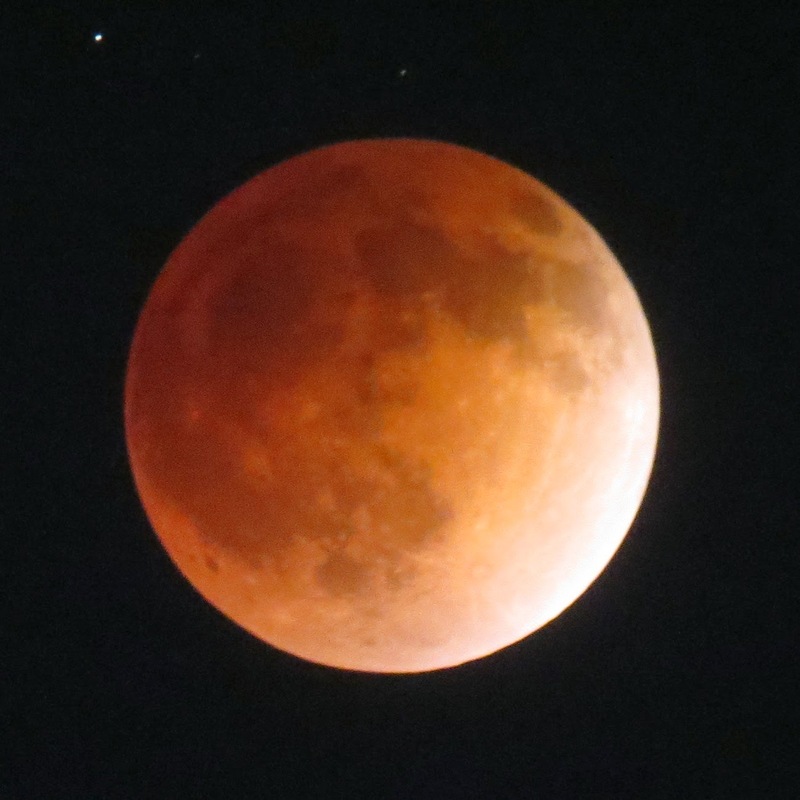 I took pictures of the moon about every 15 minutes during this last eclipse (except when it got too cloudy!) 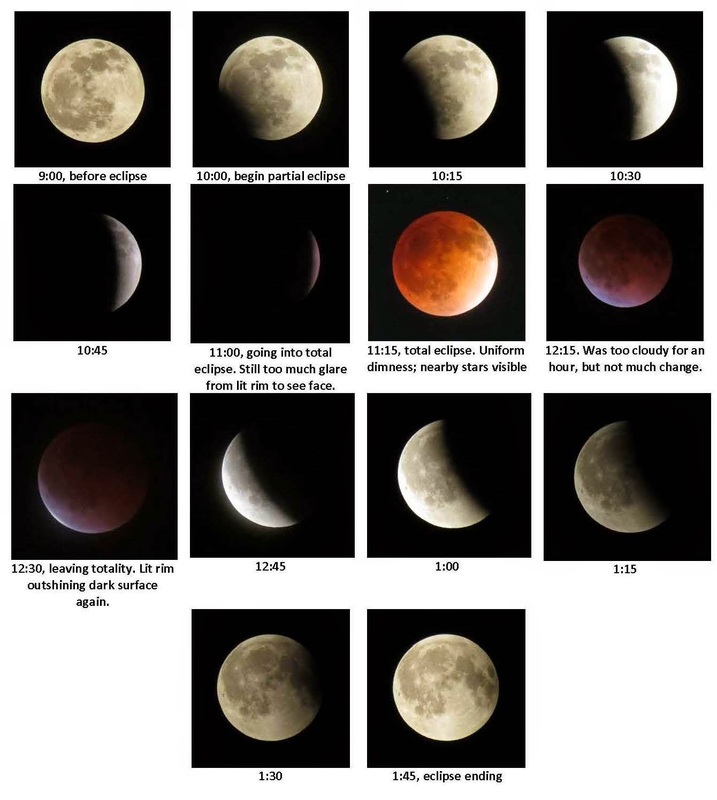 :( Here is a time-lapse montage of how the moon changed shape and brightness during that time. This is a really interesting exercise in observational astronomy and photography. 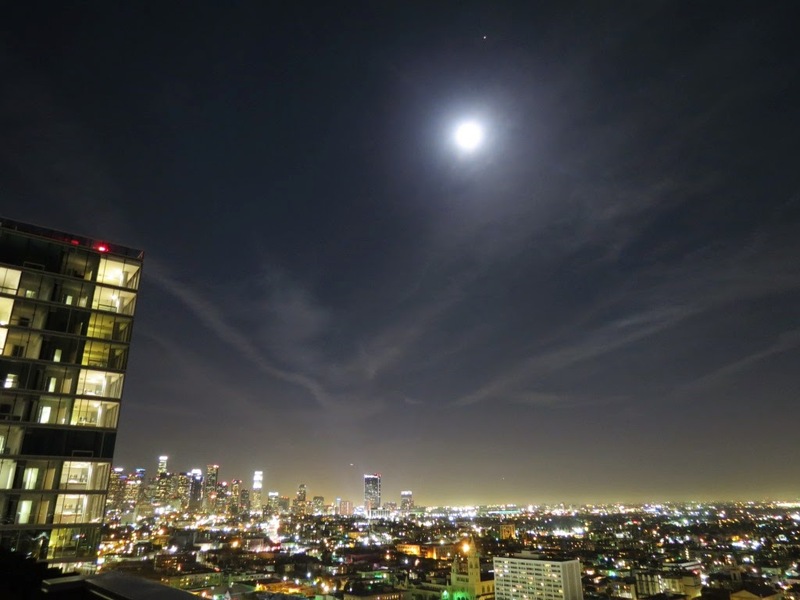 Note 1: When you face south and watch the moon, it moves clockwise (left-to-right) in the sky. Thus, you might expect the moon's right edge to enter shadow first. But you can see that the shadow creeps up on the moon's left flank! Can you understand why? (Answer below). Note 3: If you didn't know there was an eclipse going on, and you looked at the sky at times like 10:45 or 12:45 above, you'd probably think it's just a normal moon in various phases. At times like 10:15 or 1:15, it would look more unusual to you. Can you express how and why? Total eclipse. 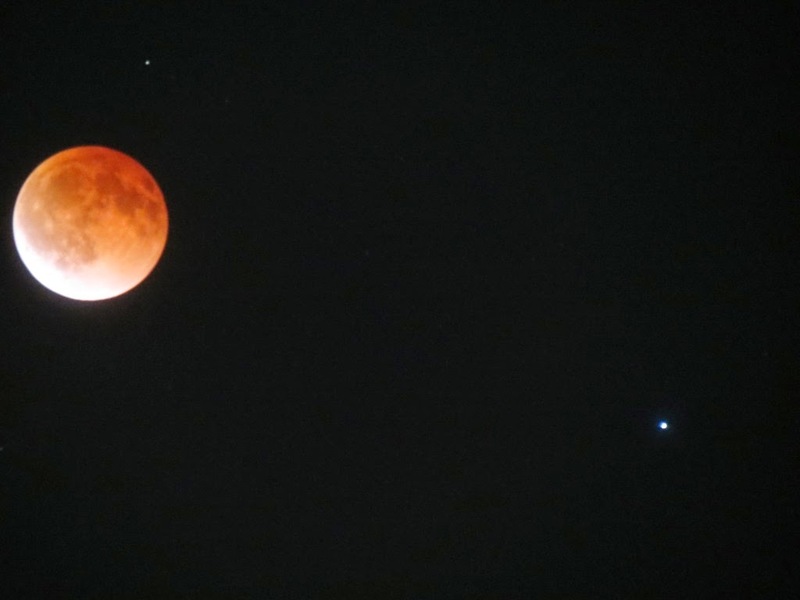 The star just above the moon was not visible before the eclipse. Larger image of the total eclipse phase. Note 1: The apparent clockwise motion of the moon is only due to Earth's counterclockwise rotation. This has nothing to do with the moon's motion. The moon also spins counterclockwise (right-to-left) in its orbit around the Earth. It's just that this motion is so slow (once / month as compared to once / day) that it is normally imperceptible. 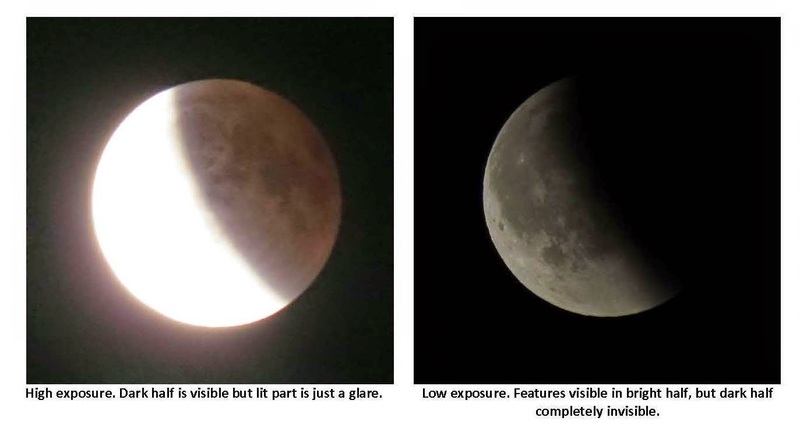 The only times we get to observe the moon's true motion are during eclipses! During this eclipse, we see the moon gradually cross Earth's shadow from right to left. As the moon was just about to exit the totality of its eclipse, I thought that a video would be a more interesting way to capture the moment. When I shot this little clip, it was very clear exactly when the moon was fully lit again, because it overwhelmed the camera. I saw that the clip was just under two minutes long, which made me think of a certain piece of music that would be fitting in more ways than one. I know it's cliche, but ...... couldn't help it! 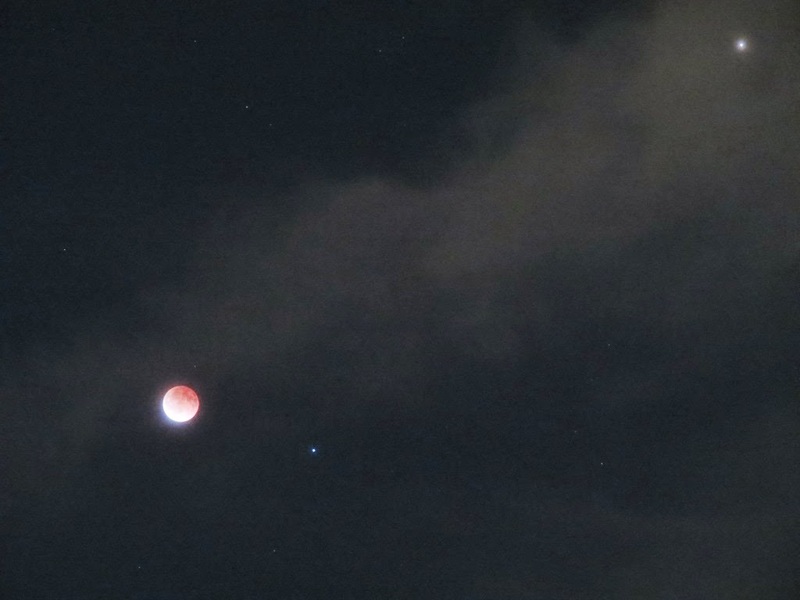 This video is also posted to my YouTube profile as Lunar Eclipse: Dramatic finish set to music, April 15, 2014.